As a participating congregation in the National Fund for Sacred Places, Broad Bay received a package of consulting services provided pro bono by the staff of Partners for Sacred Places (Partners) with additional support from our Maine based consultants Peter Heinrichs and Susan Lewis of Full Harvest Fundraising. In the summer and Fall of 2017, Partners carried out a study of the feasibility of a fundraising campaign for stabilization and restoration of Broad Bay Church, with 30 interviews of members of the congregation and with community leaders. Their findings and recommendations are presented in the Feasibility Study. Broad Bay has formed a Building Committee. This group which functions under the Board of Trustees, is responsible for “the building.” It includes members from all of the Committees of the Church. The co-chairs are Brian Scheuzger who serves on Christian Education and Jonathan Clowes who serves on Council and Trustees. Its members are Joe Russano, chair of Trustees; Linda Brandt, Deacons; Kathy Osborne, Christian Education; Maryann Guernsey, Outreach, Nancy Duncan. This group brings a diversity of perspectives and talents; working together, they will come up with a stronger proposal than they could individually. The committee served as liaison to Barba + Wheelock Architects, who prepared drawings and cost estimates to visualize the Church's dream to make the building a better platform for ministry. On October 18, Nancy Barba presented those drawings to the congregation. The following are highlights of that presentation. A narthex (the front lobby stairs of the church) with a lift that can carry people to all three levels, a reconfigured straight-run stair leading directly to glass doors into the sanctuary, a bathroom on the sanctuary level, and a set of safer stairs to the balcony. An stairway addition at the rear of the church which allows people to safety exit the sanctuary and the fellowship hall, while also providing a green room for pre- and post-function uses. A sanctuary with a larger one-step platform to allow for a variety of activities for services and events. A larger renovated fellowship hall with windows on both sides, a movable center partition, and accessible bathrooms. A renovated commercial kitchen with center island, cooking and dishwash areas, and serving windows. A Sunday School room that offers natural light, flexibility, and private meeting space for various groups. A reconfigured office area to allow privacy and ease of flow. An annex. The addition and a garden space will fill its space. A fully-restored steeple and building structure. All will be repaired. A full set of energy-efficient operable windows. Regardless of the option we choose, the windows will be addressed. An updated heating system. It will be provided throughout the building, including the narthex. And you definitely won't see water getting into the building! It will be routed away. And in these illustrations, you also won’t see: People! Everyone is welcome here. That’s the real vision. With Nancy Duncan's help, we created a draft “case statement” about the potential project. We hope that it accurately integrates a sense of Broad Bay’s vision and ministry with the design work executed by Barba and Wheelock. 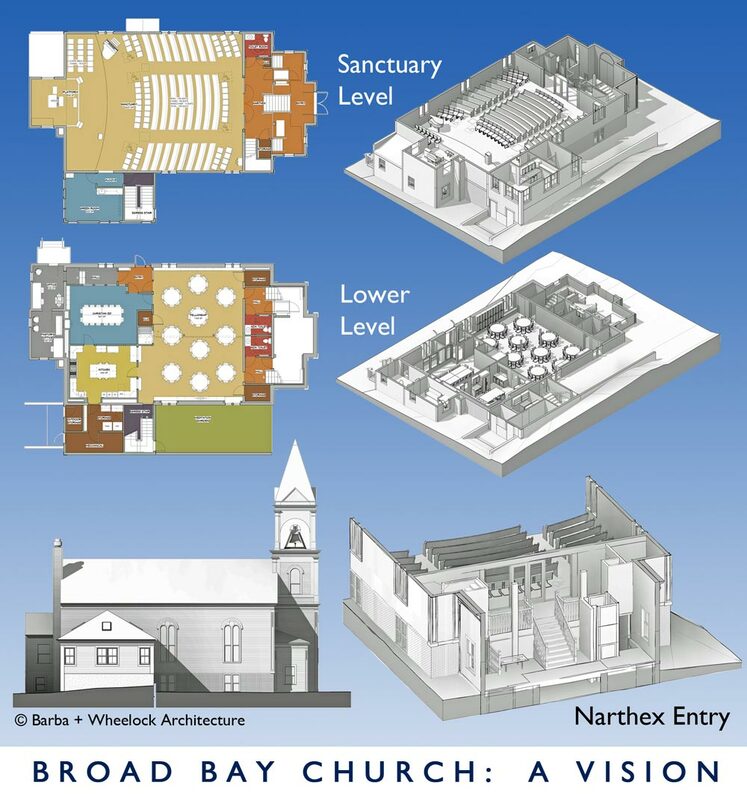 Broad Bay Church is dreaming about what it could be. . .
Our building is a platform for ministry... but it could do far more. How can it be renovated to more effectively share God's love and justice, deepen connections to others, and better serve as a sanctuary to the people of the congregation and the Waldoboro community? What is your dream for our church? Tell us in the box below. On June 5th, the congregation met to review our progress toward creating a master plan and the next steps we need to take. Click here to download a pdf of the presentation. Broad Bay Church is part of a wider community. If you speak to someone in the community about current or future connections with our church, please use this form to record your conversation. Thank you for helping us collect information.